SHOCKING (AUS) (Bay 2005-Stud 2011). 7 wins from 1300m to 3200m, VRC Australian Cup, Gr.1. Sire of 112 rnrs, 52 wnrs, inc. SW Fanatic (New Zealand Oaks, Gr.1), The Hassler - Circuit Hassler (H.K. ), Chocante, SP Antonio Giuseppe, Megawatt, Pure Pride, Electric Aura, High Class, Hello M'Lady and of Shockaholic, Camino Rocoso, Tingle Marc, Barnaby, Love Shock, Not So Lady Like, Street Smart, Volitation, What a Shock, Battlecamp, Dreaded, etc. Shocktillyoudrop (f. by Shocking). Winner at 2200m in 2016-17 in NZ. ENTIRELY PLATINUM (Pentire). 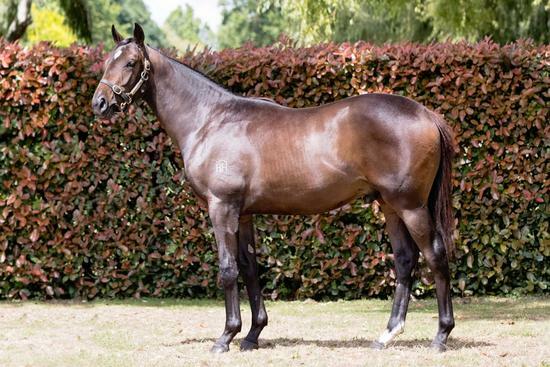 6 wins from 1400m to 1900m, A$592,510, ATC Sky High S., Gr.3, Canterbury Hurlstone RSL H., Vinery Yearlings H., Schweppes H., 2d MRC CF Orr S., Gr.1, Memsie S., Gr.1, Naturalism S., Gr.3, 3d VRC Makybe Diva S., Gr.1, MRC PB Lawrence S., Gr.2, 4th MRC Futurity S., Gr.1. Roving Owl (Volksraad). 2 wins at 1100m, 1550m, A$108,860, AJC First Fleet H., Young Members H., 2d STC Tulloch S., Gr.2, 3d BTC Rough Habit P., L, STC Harris Farm Welter H., 4th AJC Frank Packer P., Gr.3, STC Winter S., L.
James Blond - Travel Leader (H.K.) (Danske). 3 wins at 1800m, 2000m, NZ$9,500, HK$2,155,970, HKJC Mui Wo H., Elizabeth Arden H., Sutherland H., 2d ARC Guineas Trial, L, HKJC Siu Sai Wan H., 3d HKJC Osmanthus H., 4th ARC Great Northern Guineas, Gr.2. ANALYST (Deputy Governor). 12 wins from 1000m to 1800m in Macau, Macau Derby, L, Macau Cup, L, Macau Chairman's Challenge Cup, L, Spring Trophy, L, Ashburton H., Autumn Trophy, Sing Pao Spring Trophy, 2d Macau Cup, L.